Project Kics Leggdura Racing Lug Nuts UNIVERSAL - Pann Auto Performance - San Diego largest aftermarket automotive performance parts - What do you drive? 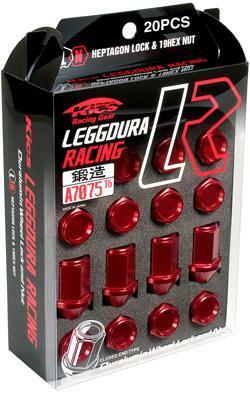 Kics is proud to announce the release of an all new racing lug nut. It’s called LEGGDURA RACING. Derived from the Italian word “leggero” for light and “duralumin” for its material composition, the LEGGDURA RACING lug nuts are made in Japan from forged A7075-T6 Aluminum alloy. Weighing a mere 22 grams per lug nut, the 20 piece set (16+4 locks) is less than 0.25 pound per wheel corner compared to stock weight of 0.50 pound per corner. That’s a 50% total weight savings which can help increase the performance aspects of braking, cornering, and acceleration.